Antonio Tizapa’s son, Jorge Antonio Tizapa Legideño, would be 22 this year. Jorge Antonio was one of the 43 student teachers from Mexico’s Ayotzinapa’s Rural Teacher’s College, that disappeared in September, two years ago. With tears in his eyes, Tizapa said that his son is alive. He said that his reason for speaking up is his son, but his drive also comes from the indignation he feels toward larger issues of corruption and impunity that have distorted Mexico’s rule of law. Yesterday evening, Tizapa, stood across the street from the St. Regis New York Hotel in Midtown, clutching in his hand a poster size picture of his missing son. He joined dozens of protesters with raised Mexican flags and fists in the air who began to chant in Spanish, “Vivos se los llevaron, Vivos los queremos!” (They were taken alive, we want them alive!). 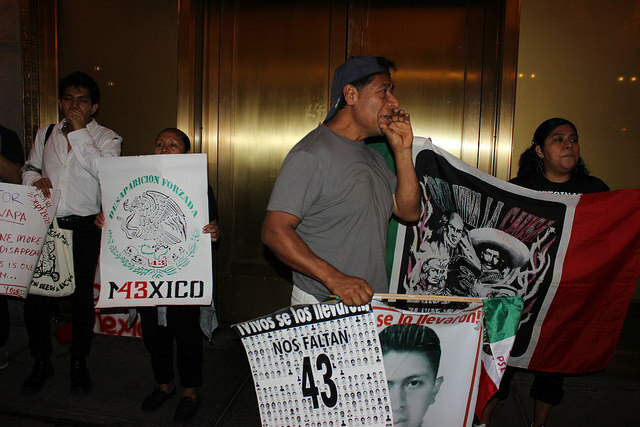 The protesters gathered to express anger and frustration towards Mexico’s President Enrique Peña Nieto’s New York visit and to remind the president of the 2nd anniversary of the mass disappearance of 43 students that took place in Iguala, Guerrero. Outside of the hotel, parents, students, and activists expressed the frustration they felt about poor policy reforms and the alleged corruption within Peña Nieto’s administration. When the protesters were told that Peña Nieto was arriving, they loudly counted up to 43 in remembrance of the missing students. The story of the 43 missing students received media attention last week, when Mexico’s Official Chief Investigator, Tomás Zerón, resigned amidst accusations of incompetence and a lack of transparency. The crime statistics in Mexico are staggering. Reports say 151,233 people were killed between December 2006 and August 2015. At least a third of the murders are connected to organized crime. At least 26,000 people have gone missing and are believed to have been kidnapped since 2007 and thousands of women are sexually assaulted. There are very few convictions. The disappearance and government’s reaction to ongoing protests has drawn criticism from the international community. In April of 2016, The Office of the United Nations High Commissioner for Human Rights strongly urged the Mexican government to take into consideration the recommendations made by the GIEI, an independent committee appointed by the Inter-American Commission on Human Rights. The GIEI’s report highlighted obstruction and inconsistencies in the Mexican government’s account of the disappearances. The report also made recommendations that included the need to strengthen the Attorney General’s office and the police department. The Mexican Government stated that they would comply with the GIEI’s recommendations, but no action has been taken. Peña Nieto who was in attendance at the Foreign Policy Association 2016 World Leadership Forum Dinner to speak on U.S.-Mexico relations, was not available for comment. His office did not reach out to protesters, who had requested to meet with him. The protesters drew a small crowd. Among them were tourists and immigrants from Mexico, who noticed the Mexican flags. Not all agreed with the protestors. Oscar Gonzalez Castillo, 27, an immigrant from Puebla, Mexico, who has been living in New York City for eight years noticed the protest on his way home from work. “I feel that it is fair that the protesters are here,” he said. “I feel bad. It is unjust for so many killings to go unanswered. I have family in Mexico. I feel helpless and sad… but I can stand here in support of the protesters,” he said.